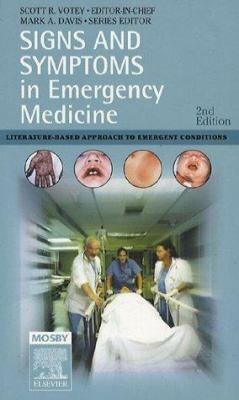 Current and concise, the updated and revised 2nd Edition of this pocket-sized reference reflects the substantial changes shaping the evaluation and treatment of many emergency conditions today. Its unique "signs and symptoms" approach offers the quickest possible way to diagnose critical conditions in an emergency situation. Organized around presenting symptoms, it can be used in real time to answer patient care questions. Diagnoses are listed in order of their severity in each chapter, with the symptoms, signs, suggested workup, and patient disposition given for each diagnosis. Used Very Good (1 available) 0323036457 Clearing Inventory! Book has minor flaw, like bent or scratched cover. Total Satisfaction Guaranteed. Quick Handling. We work every day but Sunday. Standard delivery takes 4-14 business days. Please note: Shipping may take longer if you live in Hawaii or Alaska, Puerto Rico or Guam. YOUR SATISFACTION GUARANTEED!